The 2019 Ford Escape is the perfect compact crossover for everyday drivers looking for a spacious vehicle without any bulk. This Ford offers ample cargo space without sacrificing any leg room, making this the ideal vehicle for everyday drives, weekend getaways, and cross-country road trips. Drivers can choose from four sporty Escape trim levels - S, SE, SEL, and Titanium – that are available in nine exterior color options. 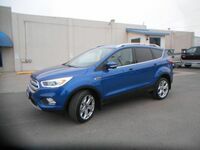 The staff at Wolf Auto Center often get asked what the differences are between the three higher Ford Escape trim levels. 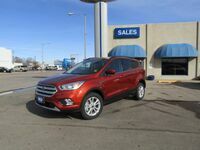 This 2019 Ford Escape SE vs SEL vs Titanium comparison is going to break down what sets these three trim levels apart from each other to help you pick the trim that is right for you. Click the link below to view our lineup of in-stock 2019 Ford Escape models, available at Wolf Auto Center. What are the differences between the 2019 Ford Escape SE, SEL, and Titanium trim levels? Three engine options are available among the 2019 Ford Escape lineup, two of which are represented in the higher Escape trim levels. The 2019 Ford Escape SE and SEL are powered by a 1.5-liter EcoBoost® engine paired with a 6-speed SelectShift® automatic transmission. This combination offers drivers 179 horsepower and 177 pound-feet of torque. For more power behind the wheel drivers can opt for the elite 2019 Ford Escape Titanium. Powered by a 2.0-liter Twin Scroll EcoBoost® engine paired with a 6-speed SelectShift® automatic transmission, the Escape Titanium generates a heart-pounding 245 horsepower and 275 pound-feet of torque. Both the 1.5-liter EcoBoost® engine and the 2.0-liter Twin Scroll EcoBoost® engine feature the fuel-saving Auto Start-Stop technology. This technology helps to lower your vehicle’s fuel consumption and emissions by shutting off the engine when the vehicle comes to a complete stop, then seamlessly restarting it when you release the brake. Front-wheel drive is standard for Escape SE, SEL, and Titanium models but drivers can opt to upgrade to the optional Intelligent 4WD. All three of these Ford Escape models’ front upper grilles are painted silver with a chrome bar insert and chrome surround that is paired with a black lower grille. Escape SEL drivers can opt to stand out from the rest of the Escape lineup and go with the available Magnetic-painted bars, inserts, and plinth with gloss black surround along with a Magnetic lower grille. SE and SEL models are fitted with 17-inch Sparkle Silver-Painted Aluminum wheels while the Titanium model wears 19-inch Machined Aluminum Wheels with Luster Nickel-Painted Spokes and Pockets.